Molded from impact resistant polyethylene. Available in low or high density configurations. The Director™ traffic drum minimizes vehicle damage and remains serviceable after numerous impacts. The Director™ tire ring base adds stability and is manufactured from 100% recyled tires. Our lock-tight system allows the Director™ to be moved without separations of the base and barrel. Available with 3M™ Diamond Grade™, High Intensity Prismatic & Engineering Grade reflective sheeting. The Director™ meets or exceeds MUTCD Specification & is tested & certified to meet the requirements of NCHRP-350 Crash Worthiness. The Director™ traffic barrel provides the service features required in a durable, plastic construction barrel. 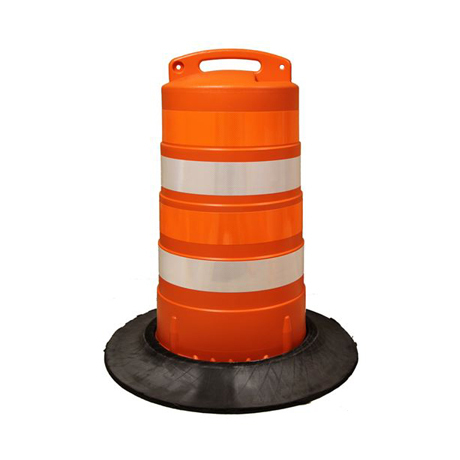 Our traffic barrels are molded from impact resistant polyethylene. Available in low or high density configurations. The Director™ minimizes vehicle damage and remains serviceable after numerous impacts. The Director™ barrel and base design minimize roll after vehicle impact. Customizable products to meet your traffic safety needs. To request a quote please use the form below. If you have a document that you would like to submit please use the PDF Upload option.